Once your baby starts to crawl you are going to need at least one safety gate. You can get standard gates which can be adjusted from 30 to 45 inches, extra-wide ones which are just wider, and specialty gates which can be used in irregularly shaped areas or around a hearth for example. Choose from gates which are screwed to wall studs or pressure gates which work like tension rods. Permanent gates are the strongest, but they leave holes behind which you will need to fill. The pressure gates are not quite as sturdy so get a permanent one for the top of the stairs and consider pressure gates for other areas perhaps. You can take the pressure gates off easily, which means you can take them to grandma’s or wherever you are visiting with your child. Different parents will prefer different types of gate, and it also very much depends on the style of your house. Perhaps you live in an apartment or bungalow. A safety gate is still a good idea, even if you do not have stairs. Keep your child in one room and out of the kitchen when you have pots bubbling away on the stove. Enjoy a fire but put a childproof gate around it first to keep your little one safe. Fortunately these days you are not limited to those old accordion-design gates which used to catch little fingers, and there are lots of excellent modern child safety gates to choose from. This gate comes with a couple of extensions so it can fit into an extra wide space if need be. It is very easy to install; you just need to insert a couple of rods on either side of the gate, insert the tensions rods and extensions (if using) and then tighten the rods to the doorway. The gate has an 18-inch doorway which is a good size, and it is 29 inches tall. This one opens in both directions, and it is either fully opened or closed. You just need one hand to open it. There is a 2-inch tall rail at the bottom of the gate which might be a tripping hazard to any guests, but you will get used to it. This gate is robust, pleasant looking and it has a door which is easy to open. Whether you want to keep your kids or pets in one particular area or seal off another area, this child safety gate will do the job just fine. How Many Places Do You Need a Safety Gate? Choosing the Best Child Safety Gate Baby gates can be made from clear or colored plastic, metal or mesh, so choose something you like because you will be living with it for a couple of years. A two-way child safety gate is good if you are going to have to walk through it often, and a hands-free gate or one which will automatically close is a good idea if you are going to be walking through it carrying laundry or bags of groceries. A good gate will be ¾ or more of your child’s height. 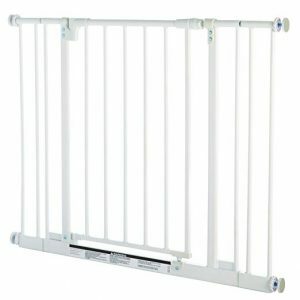 Although you can get second-hand child safety gates, be careful when buying these. Avoid anything with slats more than 2½ inches apart, because these can trap small hands or feet, and do not get an accordion-style one with diamond openings because these can trap little fingers too. 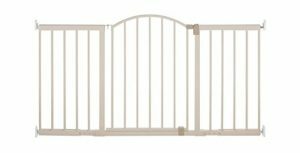 The Carlson 0930pw Extra-Wide Walk-Thru Gate is often searched for, and is a great option for a pet gate but not so good for toddlers because there is too much space between the slats. Modern child gates are much safer and better-designed than the older ones, so choose carefully because of course, you want the best for your toddler. A child safety gate is one of the most important purchases you will make, and anything that protects your child is something you need. Because there are so many different brands and types available though, you do need to shop around and see what would be a good fit in your home, what kind of gate you have the budget for and personally prefer, and which one is going to do the best job. Perhaps you had a gate for your eldest child, and you are now looking for a new one because you did not like the old one or it is no good for your new home. Today there is more choice than ever for you to consider. This gate is cheap, but it still offers high quality. It is easy to install and should only take 5 or 10 minutes to put together. It comes with extensions which you might or might not need. It is sturdy enough for kids or pets, and the opening mechanism is very simple to use. It is a locking pin on a sliding plastic piece. There is a 1-inch bar to step over when you pass through the gate, and the walkthrough width is fine. Something a lot of reviewers like is that the gate stays open when you open it. This is nice if you are carrying a basket of laundry or a toddler and do not want to have to open and close it each time you go by. The gate opens in both directions. The bars are narrow so not even a puppy could get through. It would be very difficult to beat the price if you are looking for an extra wide child safety gate. This gate are very affordable, and it is very simple to put together. It attaches securely and is very robust. Some people are worried when they first take the gate out of the box because it does not look straight. It is supposed to be like that though and will straighten up once it is mounted. The gate is 31 inches tall, and you can use it in an opening between 29½ and 34 inches. It comes with an extension which you might or might not need. The gate is pressure-mounted, so it is really easy to take down if you want to take it with you to Grandma’s house or somewhere else your toddler is going to be visiting. This is a good value child safety gate. If you do not want a white plastic-looking safety gate, what about this more elegant option? The gate is pressure-mounted and hinged. It swings closed automatically and will fit any opening between 28 and 48 inches wide. This model is 36 inches tall and looks great with any decor. Wooden gates often fall apart, and plastic ones can be ugly. This one is very modern and classy. 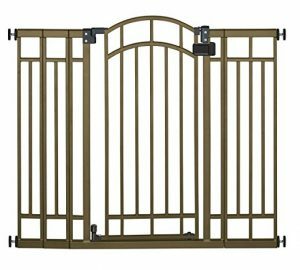 Obviously, the most important factor when buying child safety gates is the safety aspect, but this one offers safety as well as an attractive appearance. This one has a lot of positive reviews because it works very nicely. The opening mechanism is easy, and the gate itself is durable and does its job well. Although there are plenty of different brands and models of safety gates, you can categorize them in 3 main ways. First, you have the pressure-fit type of baby gates. These used to be barriers wedged in a doorway or between 2 walls. You would need to remove them or step over them to get past. Modern pressure gates have a walk-through gate, so the gate itself stays in place, and you just use the convenient door in the middle to get through without having to take the whole thing down or have to climb over it. If you are considering a pressure-mounted baby gate, you will need 2 flat surfaces opposite one another. Pressure gates cannot be mounted at an angle. A wood-framed doorway is best, but be careful if you have a hollow wall because the pressure pads might make a hole in it. They are not usually designed for staircase-mounting. If this gate does not suit your requirements, you might want to think about a hardware-mounted baby gate. Also known as stairway gates, these are ideal for staircase mounting, but also good for other areas of the home. This type is the simplest to open, and some can be mounted at an angle rather than on opposite walls. The third type of baby safety gate is the kind for wide or irregular openings. If the opening is very wide, you might need to fit extensions to the gate, but other kinds are specifically designed for wide spaces. An irregular opening might be small or large but either way, you will need a versatile gate. Some of these come with different panels, and you can use the right number of panels to fill the space. If you have a large space, such as 10 feet, you might like to fit a curved 12 feet gate to make it stronger and more rigid, for example. Although it can take longer to choose and plan a baby gate for a large or irregular opening, you can hopefully find one which is quite simple to install. Once you have chosen the right gate, you will need to mount it. The first thing to do is to read the instructions and ensure you understand them. Read the instructions when your baby or toddler is sleeping, so you can concentrate. Remember you will need to make or buy gate mounts to install the safety gate properly. The most popular kinds of baby gates are pressure-mounted and hardware-mounted walk-through kinds, so you can fit the gate in place and not have to swing the whole thing open to get through, but it depends on the type of house and door opening you have, as well as what you prefer to have. 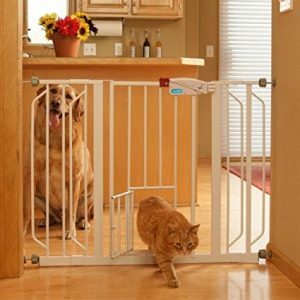 Are you are looking for a pet gate rather than child safety gates? Although many gates are dual-purpose and can be used for either, you do not necessarily want a brightly colored toddler-friendly gate if you are simply using it to keep your Labrador out of the kitchen. Although this one would work for a toddler, it was designed for pets. There is a small flap on the front of the gate so your cat or small dog can get through and any larger child or animal stays behind it. Use this one to keep your toddler out of the cat food or to allow your cat to freely roam while keeping the baby on the other side of the gate. This is a great idea if you have pets and kids and want to limit them to various areas of the house. As you probably already realized, your little boy or girl is probably the Indiana Jones of the house. Always looking to slide down the stairs, to run outside if a big sister or big brother forgets to close the front door, to climb up a shelf… To resolve this problem, you probably need a baby safety gate, to keep your baby in an area free of danger. However, some houses, especially newer houses, have openings that the standards baby safety gates can’t fill. In this case, you will need an extra wide baby gate. While you can get around most of the time with normal size baby gates, sometimes an extension (or two… or three) is simply not enough. You sometimes need to install a baby gate in an odd opening, a wide opening or to create play areas for your child. This is where extra wide baby gate can come in very handy. Before purchasing a baby gate, it is important that you decide which area you want to keep baby off. Then measure the opening. If the opening is larger than 44 inches wide, the following gates may be more suitable to your needs. – Probably our favorite because it is highly customizable. Many new houses have an open floor plan, and parents have to block huge space to keep baby in a secure environment. The Summer Infant Sure and Secure Custom Fit Gate can easily customize to fit any floor plan or size. A great option for huge spaces extremely very easy to install. 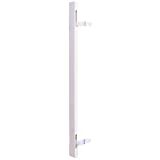 The Dreambaby hallway gate comes with a 3.5″ extension as well as a 7″ extension. While the gate fits a maximum of 53″ with the included extensions, larger extensions can also be purchased. Pressure mount, the gate also comes with mounting cups for optional use. And is very easy to install. Toddler tested and approved! 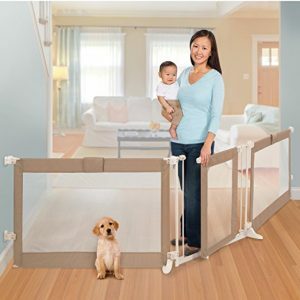 This extra wide baby gate is easy to install and works great in any wide openings. Easy to use with one hand, the gate swings in both directions. The Summer Infant Sure and Secure 6 Foot Metal Expansion Gate is sturdy and hardware mounted, for extra protection. A good looking gate with high ratings. Many pressures wonder what they should choose between hardware or pressure gate. Here are some facts for you. – Hardware mounted gates ARE ESSENTIAL when a gate is used a the top of a stairway. – Pressure mounted gates can be easily moved from one room to another, or one house to another. This is why you need a baby gate for stairs: I got distracted one day, and my little explorer decided he wanted to discover some more of the house on his own. By the time I found him he had somehow managed to maneuver himself up to the middle of the staircase. I found him quickly because he was scared and howling. He wasn’t sure whether to carry on up the stairs but had no idea how to get down again. That was a major accident waiting to happen, and I felt terrible. According to CBS News, a report found nearly 932,000 children younger than 5 were sent to the emergency room between 1999 and 2008 – that’s nearly 100,000 kids per year treated for falling down the stairs. Get a retractable baby gate before your child becomes a statistic. My son is so active I had to buy two, one for the top of the stairs and one for the bottom. When you shop for a baby gate, you will have to measure the distance it needs to span and decide how you can best attach it. The gate isn’t safe until it is solidly affixed on both sides. Toddlers seem to love grabbing onto bars, and if those bars are part of a baby gate at the top of the stairs, you’d better make darn sure it isn’t going to budge with some persistent shaking! A baby gate should be adjustable to fit tightly into the space you want to block. Don’t worry; you won’t have to drill holes in your walls, the majority of baby gates work with pressure, sturdy pads protect the walls from damage. If space is small enough – just the width of a normal staircase – the whole gate will swing open allowing you access. If space is a larger, then you can find many gates that include a smaller gate in the center. Make sure the catch cannot be opened easily by small hands! A baby gate doesn’t have to be an eyesore. Years ago there wasn’t much choice, but now there’s an enormous variety, and you should be able to find something that fits in with the look of your house. Even if you can’t find a design that you like – remember it’s the safety of your child that’s most important here. As your child gets older, it’s inevitable he will want to go upstairs on his own. Just because he’s over 5 doesn’t mean he’s out of danger on the stairs. Teach him to always hold onto something as he goes up and down and never run to or try to go up more than one stair at a time. So what to do with the gate when he gets older? I use mine when the weather’s nice and I have the back door open. My baby gate keeps the dog from going in and out and constantly tracking dirt everywhere! You will also like these posts..